A lot of Bollywood movies have created a soft spot for countries like Switzerland and France in the hearts of Indians everywhere. It’s no wonder that you’re interested in traveling to the Schengen nations. Europe, the land of wonders, is one of the most visited continents in the world. If you wish to visit Europe, you need to hold a Schengen visa. In this article learn more about how to apply for a Schengen Visa from India, Schengen Visa Application Requirements, Fees and Guidelines for Indian Passport Holders and Indian Citizens, List of Schengen Embassies in India. Of all the Schengen countries, Switzerland is the most visited by Indians, followed by France, Germany and the Netherlands. 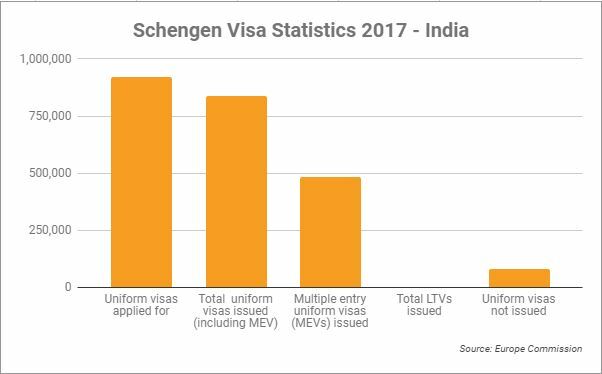 Today, India is the fourth highest applicant for Schengen visas with 920,699 applicants in 2017. Out of these, 837,109 applicants were granted the Schengen visa, 57% of which were multiple entries visas. The Schengen visa is a visa that is provided by the Schengen Area member countries to travelers who wish to visit any of the member states. 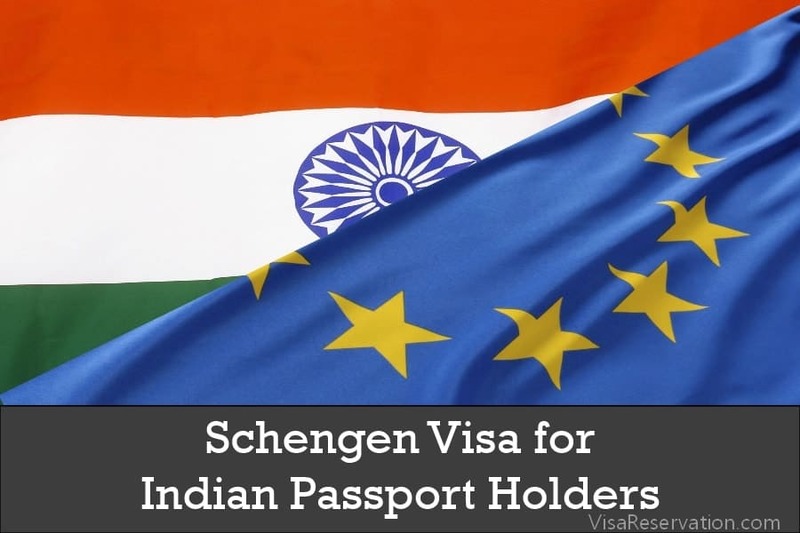 An Indian national who holds the Schengen visa can visit any of the Schengen countries freely, without having to take additional visas. If you wish to apply for a Schengen visa in India, you can visit one of the VFS centers in the national capital Delhi or state capitals like Bengaluru. You can also visit the respective embassies listed here. Uniform Schengen Visas – They allow the holder to visit any Schengen state for up to 90 days within 6 months of issue. The visa can be a single entry, double entry or multiple entries. Limited Territorial Validity Visas – They allow the holder to visit particular countries only and bar the holders from entering any other Schengen country during the visit. National Visas – They are provided to students and working professionals who have to reside in the Schengen country for study or work. This can be either single or multiple entry visas. The Schengen visa process takes up to 2 weeks to complete and the embassy may take a further 10 days to contact you. It is advisable that you apply for the visa at least 1 month before your planned trip. Once you’ve scheduled the appointment, you need to visit the embassy’s website or office to collect the application form. Two passport size photographs of 32-36 mm height in a plain background. 70-80% of the photograph must show the full frontal image of the applicant’s head. Photos must not contain red-eyes, reflections, and shadows. All documents must be personally handed over to the concerned person at the embassy. Once the embassy verifies the authenticity and validity of your documents, a face-to-face interview will be scheduled. During the interview, the embassy official will ask you questions regarding your reason for visit, the duration of visit, places on the itinerary and so on. He/she will also check the financing you have for the travel and will check all of your documents to see if the answers tally with the information you’ve provided during the interview. This interview is crucial to your visa application acceptance. You need to convince the embassy official that you intend to abide by all the laws of the host country, that you intend to return to your life in India and that you have made arrangements for everything you need at the countries you plan to visit. Once the visa interview is over, the embassy official will take your biometrics. This biometrics will be tagged to your documentation and they act as records of identification during your travel. However, if the visa application has been rejected, the letter will contain information about the reason for rejection. Providing incorrect personal or professional information or withholding information in the application form may result in your visa application being rejected. If you have had any ‘criminal’ activity recorded against your name in public records, you may be disqualified from applying for the Schengen visa. This criminal activity can represent anything from non-payment of parking fines to large-scale financial fraud. If you do not furnish the flight tickets or travel insurance to the visa office in time, it may result in rejection of the visa application. A sponsorship letter is essential for anyone whose travel to a Schengen country is being sponsored by a resident or citizen of that Schengen country. The absence of the sponsorship letter may disqualify you in the eyes of the embassy. Not furnishing the detailed travel itinerary for the entire trip or providing only a half-planned itinerary can result in your application being disqualified. As per the Consular, Passport & Visa Division, Ministry of External Affairs, Government of India, a passport that is due to expire within 3 years must be renewed or the passport holder may be subject to the risk of visa application rejection. All passport holders must furnish proof of steady income to the embassy when applying for the Schengen application. Failure to do so may result in your visa application being denied. Additionally, any income that the embassy feels may not support the expenses of the Schengen country may be subject to visa application rejection. Non-submission of education certificates, marriage certificates, employment certificates and proof of national identity or submission of forged documents may make the applicant vulnerable to visa application rejection. Schengen visa applicants are required to get travel insurance of a minimum of $50,000 or €30,000 per head for their visit. Travel insurance of lesser value or one which does not satisfy the terms and conditions of the Schengen countries the applicant is visiting may be subject to visa denial. Whether it’s an Airbnb home or a hotel or a sponsored accommodation, applicants need to specify where they intend to stay during their visit and the dates of arrival and exit. Additionally, a copy of the tickets to tourist spots must also be attached. If a sponsor is taking care of accommodation and entertainment, he/she must send across the relevant documentation and details to the embassy. 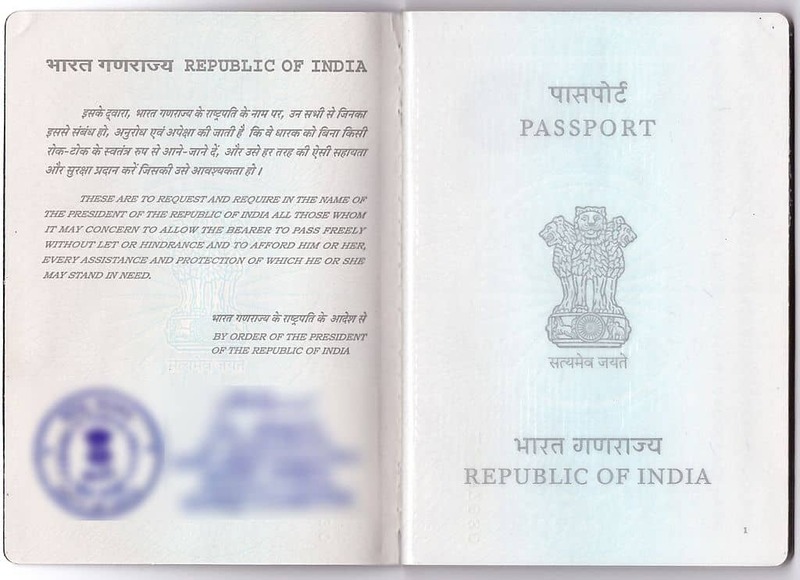 If the passport has a missing page or a tear on one of the pages or contains a mark that is not allowed (to be on the passport) by the Indian visa consular and the embassy, the visa application is denied on the grounds of tampering with the passport. Tampering with the passport is a punishable offense and many countries blacklist visitors whose passports have been tampered with in any way. Any applicant who has either by mistake or incomplete consciousness of his/her actions, disobeyed with any of the requirements of the visa application procedure will be denied the Schengen visa. How to ensure your application for Schengen visa is accepted?